Analysis: Webb is an interesting player to have in the fold given his capabilities on both offense and special teams. 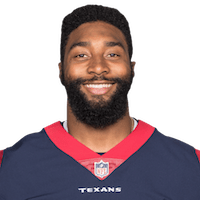 In addition to serving as a depth quarterback, the 32-year-old also functions as an emergency wide receiver -- which proved useful in 2018 when wideout injuries forced Webb into playing 32 offensive snaps in Week 14 against the Colts. In Houston, Webb is the clear third-string signal-caller behind Deshaun Watson and AJ McCarron. Analysis: Webb was cut by the Texans on Saturday as the reserve quarterback was an original omission from the 53-man roster, but a spot became available and the team elected to bring back the versatile 31-year-old. He'll continue to provide depth behind starter Deshaun Watson with Brandon Weeden still on the roster as well. Analysis: Not surprisingly, Webb was off target on more than half of his throws, but his versatility was on full display. For a quarter-and-a-half, Webb played on various special teams units before being inserted at quarterback midway through the second quarter. He moved the chains a couple of times with his legs and apparently will do anything to make the team. At present, he's third on the depth chart behind Deshaun Watson and Brandon Weeden. Analysis: Webb has thrown only seven passes in an NFL game since 2011, with both completions coming last season with the Bills after he was forced to play quarterback in an overtime game against the Colts that featured heavy snowfall. While Webb is still considered a quarterback, he'll likely be used in different spots on the field when needed given his diverse skill set and athleticism. Analysis: Webb dealt with an ankle injury throughout the week, leading to his questionable tag entering Sunday's game. Though he's active, he's unlikely to see any game action unless both Tyrod Taylor and Nathan Peterman were to go down with injury. Webb (ankle) is listed as questionable for Sunday's game against the Jaguars. Analysis: Webb was a limited participant in practice all week due to an undisclosed ankle injury. However, as the Bills' No. 3 signal caller, his potential absence isn't a pressing concern. Webb will serve as the backup to Tyrod Taylor (knee) in Sunday's game against the Dolphins, Chris Brown of the Bills' official site reports. Webb went 2-for-6 for 35 yards with no touchdowns and one interception in Sunday's 13-7 overtime win over the Colts. He also rushed five times for 27 yards. Webb rushed three times for 27 yards and threw an incomplete pass in Buffalo's 23-3 loss to New England on Sunday as the Bills sprinkled in some wildcat looks into their struggling offense. Analysis: The pass surprised the Patriots, and if Webb didn't overthrow Travaris Cadet, it would have been one of the more creative touchdowns of the weekend. While it's pretty impossible to use Webb to gain a fantasy edge, the development could at least open up the Buffalo offense a bit if the Bills start using the wildcat look until someone shuts it down. The Patriots, who have been fantastic defensively lately, notably had difficulty defending it.